The Château de Cheverny is located in the village of Cheverny, in the département of Loir-et-Cher in the Loire Valley in France, and a short distance south-east of the attractive town of Blois. The castle was built by the Hurault family from 1624 to 1630, on the site of an earlier feudal castle. 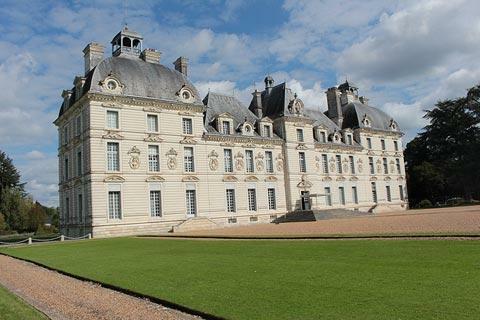 One of the last Loire Valley castles to be built, the castle at Cheverny is in white stone and follows the classical style that was popular at the time of Louis XIII. It is built to a symmetrical design, and is unchanged and unaltered since the time the building work was completed. Over the course of the centuries the castle changed hands on several occasions but each time it eventually returned to the Hurault family, who still own and run the castle today. France This Way comment: the Chateau de Cheverny is interesting to visit and compare with most of the castles in the Loire Valley, because it was built later as a residential castle and does not incorporate any defensive elements such as towers and moats. 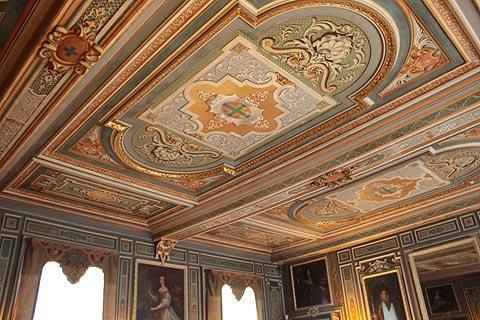 The interior decoration is also based in the luxury of the 17th century rather than the earlier periods that you will see in many castles here. 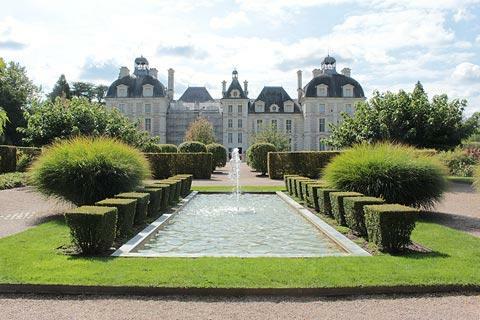 When you first enter the grounds it is the south facade of Chateau de Cheverny that you see across the lawns, as inspired by the Luxembourg Palace in Paris. This is typical of the French classical style of architecture which is very familiar to us now but was quite new at the time the castle was built. 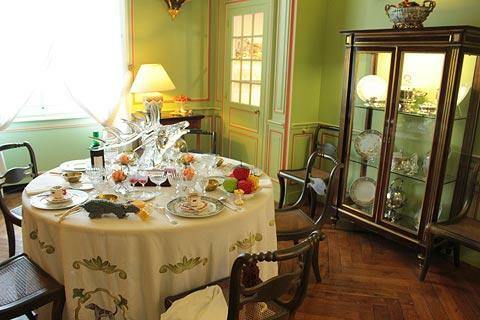 It is generally agreed that Cheverny is the most beautifully furnished of all the castles in the Loire Valley, and you will see numerous beautiful examples of 17th century furniture and wall coverings as well as ornaments, clothes and other small objects that help bring the visit to life. 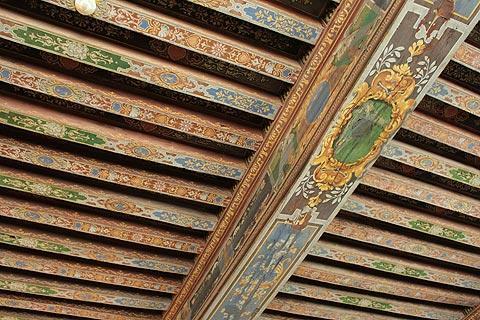 As soon as you enter you can see the beautiful painting of the wooden panels representing Don Quixote in the dining room, and a lovely painted ceiling. Next you reach the stairs which you will notice are straight rather than a spiral staircase. 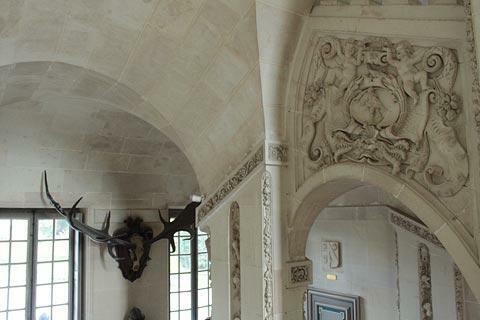 The staircase has some very ornately decorated stonework and you can also a 16th century suit of armour and some prehistoric antlers discovered in Siberia! 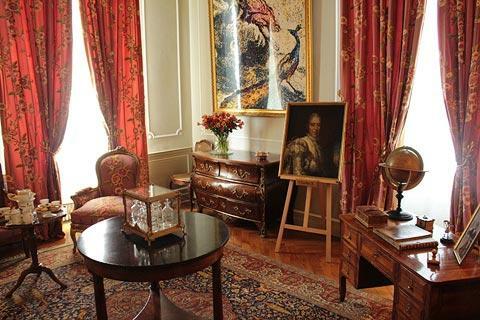 After passing the quite modest private apartments you reach some very grand rooms: the arms room is a large room with tapestries, paintings, and an exotic fireplace and the King's bedroom, a very luxurious room with lots of tapestries and a colourful painted ceiling. 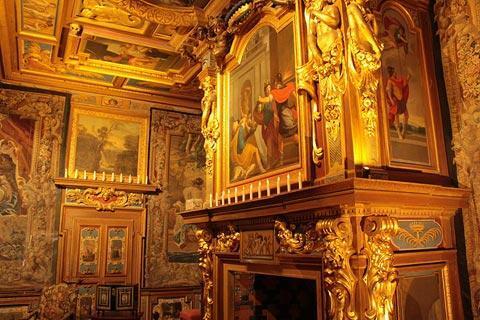 It is also here that you can admire the chapel, that was decorated in the 19th century. Returning to the ground floor the highlight is the Grand Salon, with many interesting items and another beautifully painted ceiling, as well as the tapestry room and the library. You will notice that overall the castle is less large than you might expect from the outside: it is very long and thin compared to most castles! 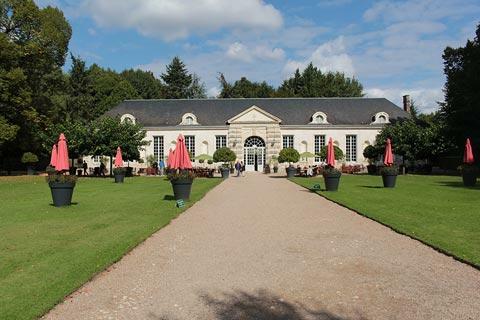 You can now leave the castle and walk towards the orangerie through the gardens. This side of the castle, the north facade, is in the Louis XIII style, and quite different to the north facade: here the emphasis is on the stonework along the corners and around the windows. 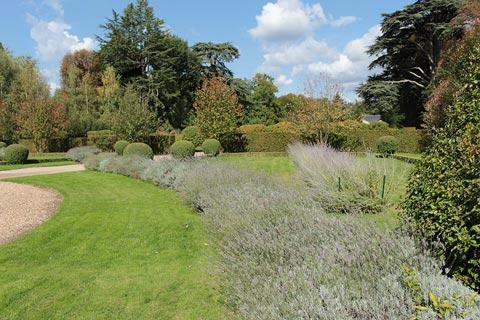 As you walk further the view is enhanced by the ornamental gardens and pond. 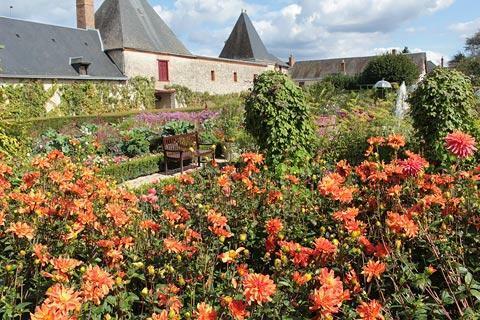 The gardens and park at Cheverny are very extensive although most of the area is parkland rather then formal gardens. 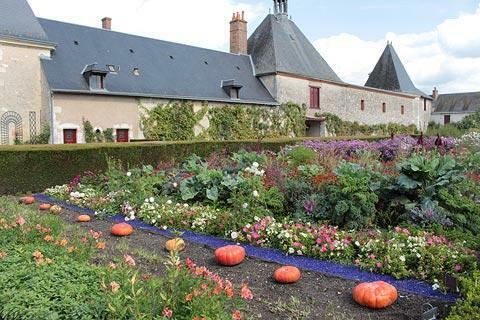 The main area of formal gardens is between the chateau and the orangery, and the flowers and plants in the vegetable garden are also very picturesque. 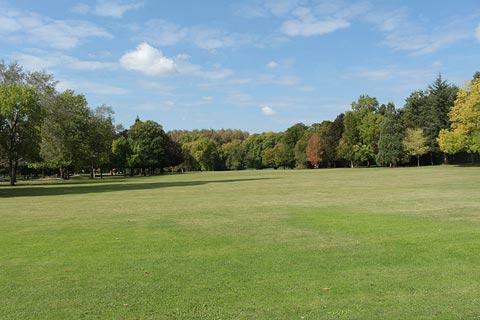 Be sure to allow time to explore the park as well as the gardens close to the castle: this is carefully laid out in the style more commonly seen around country estates in England and for us the park was a particular highlight of a visit. If you are able to visit in April you can see the 1000s of flowers in the tulip garden. 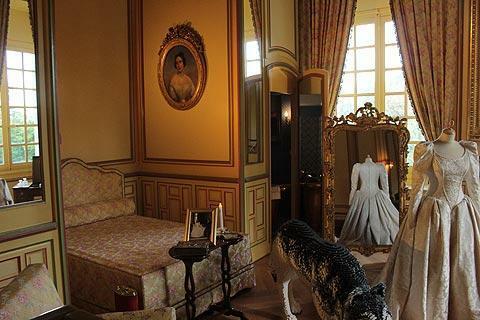 2) Enthusiasts of the tales of Tintin will be familiar with Moulinsart, which Hergé based on Chateau de Cheverny. Because of this association, you can visit an exhibition of events taken from the Tintin stories, recreated in life size in a new building at the castle. The chateau is open every day of the year from 10.00 until 17.00, including Christmas Day and New Year's Day, with longer opening hours in the summer. The basic ticket costs 9.50 euros for adults and 6.50 euros for children and includes the castle and gardens, with a supplement payable for visits including the Tintin Exhibition and/or the boat ride. Just outside the main entrance to Cheverny castle, the village of Cheverny is very small but picturesque so take a look before leaving. A short distance to the north of here you will certainly want to visit the Chateau at Chambord, the largest and most visited castle in the Loire Valley. To the north-west, the town of Blois also has a castle as well as a historic centre to explore. See more Loire Valley castles.